Miquel Serra y Ferrer, founder of the California Mission System, was born in Majorca Spain in 1713. 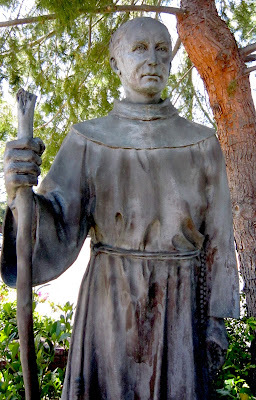 He took the religious name Junipero, in honor of Saint Juniper an early follower of Saint Francis Assisi. Fra Junipero Serra became a missionary of the Order of Friars Minor (OFM), the Franciscans. He served his church in Spain, Mexico and eventually in Baja and Alta California. From his headquarters in the Mission San Carlos, his oversaw the Catholic Missions of California, including the Mission San Fernando Rey de España in Mission Hills. He died in 1784.